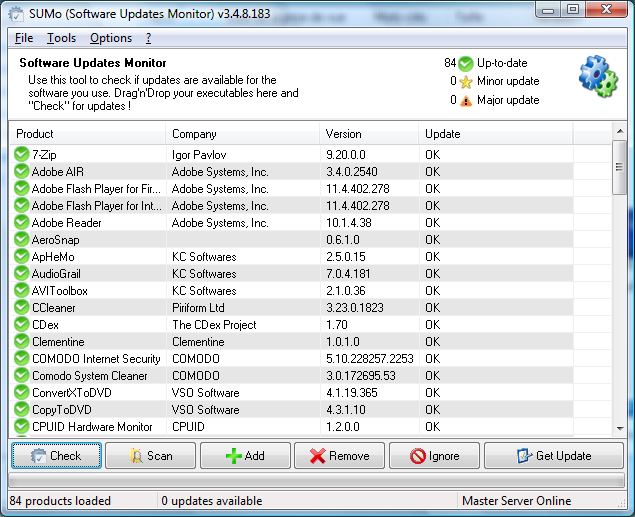 Keep your PC up-to-date and safe by using the most recent version of your favorite software - SUMo (Software Update Monitor)! SUMo PRO 4.0 was available as a giveaway on July 23, 2015! How would you improve SUMo PRO 4.0? 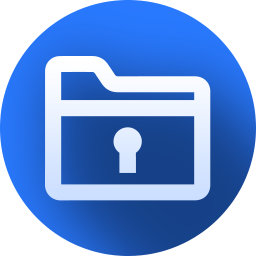 Zer0 is a user friendly file deletion tool with a high level of security. With Zer0, you will be able to delete files and prevent file recovery by a 3rd person. No user reported a more efficient method to recover files deleted by Zer0. I think that SuMO have the best database, but in every tool like that you'll find errors. Reporting it is a bit non-userfriendly (by mail), but I reported some mistakes and yeah, it surely works. And I think it's the best point. You can help and not wait ages for change. Keep in mind that's sometimes it's virtually impossible to detect correct version, like in case of KiTTY (fork of PuTTY). There's wrong exe description, but ok, it's possible to parse it and get correct version of fork. Still the version is often wrong. So you would have to parse exe resources and regexp version number, which is pointless. Oh, and one good point more. As SuMO sends version of used software to server and they publish stats, you can see usage statistics. Very helpful. I would like to say, Kyle, that while your program looks functional, it is hard to use. Here, on my 27" monitor, the characters in your program are about a millimetre (1 mm) in height. It makes it very hard to read ..even with reading glasses. Any chance you can 'read' the screen resolution (2560 x 1440, for instance), or provide a font-size setting for your GUI? If not, it will make people reluctant to attempt to use your offering. I would like to say, Kyle, that while your program looks functional, it is hard to use. Here, on my 27" monitor, the characters in your program are about a millimetre (1 mm) in height. It makes it very hard to read ..even with reading glasses. Any chance you can 'read' the screen resolution (2560 x 1440, for instance), or provide a font-size setting for your GUI? If not, it will make people reluctant to attempt to use your offering. Thx. Nothing in all of "computerworld" gave me more head aches than "upgrades" ... If your computer is running fine, your programs do what you expect 'em to do: then DO NOT UPDATE ANYTHING. There is only 2 (TWO) programs that I allow to update : Avast and ZoneAlarm. If a program comes up with an IMPORTANT update, like new features (that are important for ME! ), then I try to find out if there is a complete new version available. If there is, I uninstall the "old" program with e.g. Revo and then reinstall the new version. But I always try to find out first WHAT the updates do, add, change, alter ... Too bad that often that information is not available in a clear language, or not available at all. Never change a winning team ! Nothing in all of "computerworld" gave me more head aches than "upgrades" ... If your computer is running fine, your programs do what you expect 'em to do: then DO NOT UPDATE ANYTHING. There is only 2 (TWO) programs that I allow to update : Avast and ZoneAlarm. If a program comes up with an IMPORTANT update, like new features (that are important for ME! ), then I try to find out if there is a complete new version available. If there is, I uninstall the "old" program with e.g. Revo and then reinstall the new version. But I always try to find out first WHAT the updates do, add, change, alter ... Too bad that often that information is not available in a clear language, or not available at all. I would love to have tried this software, but there's no way I'm creating a facebook page or a Twitter account. I've filled in the email request for the past two days and so far not received any download links. I've been recommending the giveaway and later the game giveaway sites since I first discovered the giveaway site back in Novemebr 2006, and the start of the game giveaway site in December 2006. I've probably passed on links individually to hundreds of people and recommended the site in the activities feed on Valve's Steam as well as several gaming sites I've frequented over the last nine years. I would love to have tried this software, but there's no way I'm creating a facebook page or a Twitter account. I've filled in the email request for the past two days and so far not received any download links. I've been recommending the giveaway and later the game giveaway sites since I first discovered the giveaway site back in Novemebr 2006, and the start of the game giveaway site in December 2006. I've probably passed on links individually to hundreds of people and recommended the site in the activities feed on Valve's Steam as well as several gaming sites I've frequented over the last nine years. For what's worth I used the email option and the email arrived instantly. I assume you checked your spam folders and filters but just wanted to let you know it worked for me in case you thought their system wasn't properly functioning. Just attempting to be helpful, hope you get things working so you can enjoy the programs we have presented each day. SUMO free does a great job. What is the difference and why do we need a pro version. In addiction, sumo has quite some versions for instalation. If you are not aware of that, you may find that you picked one of sumo's versions that during installation adds some other, unwanted software to your computer. Does this pro version behave the same? SUMO free does a great job. What is the difference and why do we need a pro version. In addiction, sumo has quite some versions for instalation. If you are not aware of that, you may find that you picked one of sumo's versions that during installation adds some other, unwanted software to your computer. Does this pro version behave the same? SUMo PRO adds automatic self aupdate features. 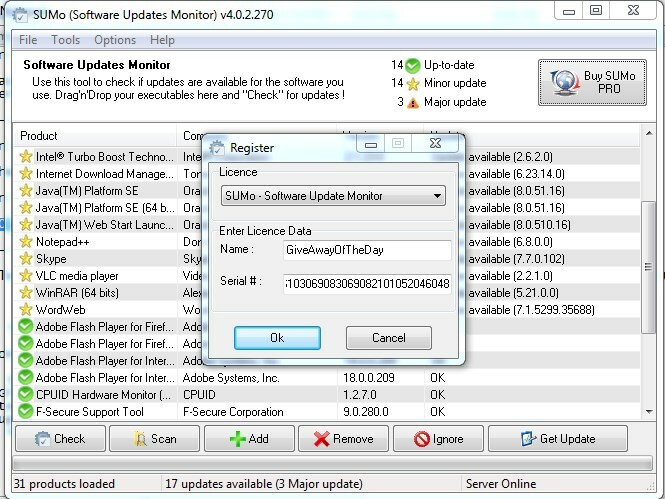 no unwanted software in SUMo and no sponsors at all in SUMo PRo automatic update installer. I have used the Sumo-lite free version (no sponsors or adverts) for years and found it excellent. I installed the Giveaway Sumo Pro version and after running the setup program it brought up the Giveaway site saying the program had been registered. But it hadn't been. When Sumo started, it was the free version. I had to go into the registion page and copy in the name and serial number from the Giveaway text file. Then Sumo Pro ran fine. I will not allow any software that can send any info out, without me ever knowing what that is, to be installed. What info would you precisly request ? Expand that philosophy would you, please, Mike2? As Kyle, says, what info would you send out and expect to receive in return, and how would you observe either? How would your knowing more affect the updating process? Expand that philosophy would you, please, Mike2? As Kyle, says, what info would you send out and expect to receive in return, and how would you observe either? How would your knowing more affect the updating process? Please be careful not to ruin your GOTDs and other giveaways which usually are transferred to demos if updated! Many, perhaps even most people don't update, including Windows, installed software, & any hardware driver software. Statistics say that by far most people & companies that get breached or infected by malware did not update, & That's Why their network got breached &/or their system(s) got infected. Forgetting security [but just] for a moment, if you check software or hardware support forums or tech support, when someone has a problem, most often the 1st question is if they performed the latest update. Updates aren't created because there are coders &/or software engineers sitting at the table bored, with nothing else to do. So the idea behind SUMo is a very good one. Just ask Microsoft -- updates are mandatory in Windows 10, & anyone using the Home version will not be able to delay them. Or look at the Android ecosystem... in the US you might not be aware of it because your cell phone updates are delayed, coming through your carrier, but a day without app updates is rare. SUMo just brings a good habit to Windows, in a way that hopefully makes it more convenient. And you have more control over it than say McAfee, which by default *forces* you to do the same. "Inconsistent German/English language mix. This should not be…"
I would guess that the developer probably agrees, but from the product page it appears that translations are done by volunteers, & so might be more spotty than if the budget allowed for paid professionals. "Sumo usually also has a Web link to the homepage of the update software, so you can get the update from there." As you should want IMHO... if you're using the free version, be nice & use their bandwidth instead of the developer's, since they already give you the benefit of their labor free. If you're more security conscious, by habit the only source you trust is the people or company that wrote the software to begin with. "drivers… simple rule…if it ain’t broken, there is no need to fix it"
No offense intended, but you know "it ain't broken" how? The problem isn't that the companies making hardware have a large crew of driver software coders that they want to keep busy -- it's just the opposite. Nowadays it's got to be important for them to spend the cash -- many won't, regardless. If a company's coders were perfect [no coder (or person) is], the only driver updates ever needed would be for new versions of hardware or Windows. So it's only logical that if they're fixing mistakes, they might make mistakes in the fix. SO do back up 1st before you update. "I am a little confused, happens sometimes… on kc softwares website SUMo page I find SUMo is Free Software, in addition There is a very small entry for SUMo Pro and it only lists “SUMo PRO adds automatic self-update capabilities to SUMo.”"
My guess, & it's just that, a guess, is that the developer is trying to pay for the work of creating & maintaining the program. Like many free apps there's a donation button or link on the product page. It's also not unusual for those giving away software to create a paid version, I assume because the donations aren't sufficient to cover costs, e.g. the popular CCleaner [which coincidentally has a new version out today]. Many, perhaps even most people don't update, including Windows, installed software, &amp; any hardware driver software. Statistics say that by far most people &amp; companies that get breached or infected by malware did not update, &amp; That's Why their network got breached &amp;/or their system(s) got infected. Forgetting security [but just] for a moment, if you check software or hardware support forums or tech support, when someone has a problem, most often the 1st question is if they performed the latest update. Updates aren't created because there are coders &amp;/or software engineers sitting at the table bored, with nothing else to do. So the idea behind SUMo is a very good one. Just ask Microsoft -- updates are mandatory in Windows 10, &amp; anyone using the Home version will not be able to delay them. Or look at the Android ecosystem... in the US you might not be aware of it because your cell phone updates are delayed, coming through your carrier, but a day without app updates is rare. SUMo just brings a good habit to Windows, in a way that hopefully makes it more convenient. And you have more control over it than say McAfee, which by default *forces* you to do the same. <i>"Inconsistent German/English language mix. This should not be…"</i> I would guess that the developer probably agrees, but from the product page it appears that translations are done by volunteers, &amp; so might be more spotty than if the budget allowed for paid professionals. <i>"Sumo usually also has a Web link to the homepage of the update software, so you can get the update from there. "</i> As you should want IMHO... if you're using the free version, be nice &amp; use their bandwidth instead of the developer's, since they already give you the benefit of their labor free. If you're more security conscious, by habit the only source you trust is the people or company that wrote the software to begin with. <i>"drivers… simple rule…if it ain’t broken, there is no need to fix it"</i> No offense intended, but you know "it ain't broken" how? The problem isn't that the companies making hardware have a large crew of driver software coders that they want to keep busy -- it's just the opposite. Nowadays it's got to be important for them to spend the cash -- many won't, regardless. If a company's coders were perfect [no coder (or person) is], the only driver updates ever needed would be for new versions of hardware or Windows. So it's only logical that if they're fixing mistakes, they might make mistakes in the fix. SO do back up 1st before you update. <i>"I am a little confused, happens sometimes… on kc softwares website SUMo page I find SUMo is Free Software, in addition There is a very small entry for SUMo Pro and it only lists “SUMo PRO adds automatic self-update capabilities to SUMo.”"</i> My guess, &amp; it's just that, a guess, is that the developer is trying to pay for the work of creating &amp; maintaining the program. Like many free apps there's a donation button or link on the product page. It's also not unusual for those giving away software to create a paid version, I assume because the donations aren't sufficient to cover costs, e.g. the popular CCleaner [which coincidentally has a new version out today]. I usually use a combination of filehippo (which also informs you of updates to GAOTD offerings that will render freebies null if installed) and Ninite. If nothing else, tools like this are a good way of checking to see what is out of date. As fas as being 'A useful program, if you are lazy with updates.' is concerned, if we adopted that thought process in all things then we would not use computers and many other time saving gadgets in our lives in the first place would we? I usually use a combination of filehippo (which also informs you of updates to GAOTD offerings that will render freebies null if installed) and Ninite. If nothing else, tools like this are a good way of checking to see what is out of date. As fas as being 'A useful program, if you are lazy with updates.' is concerned, if we adopted that thought process in all things then we would not use computers and many other time saving gadgets in our lives in the first place would we? "As fas as being ‘A useful program, if you are lazy with updates.’ is concerned, if we adopted that thought process in all things then we would not use computers and many other time saving gadgets in our lives in the first place would we?" I don't think Karl meant it in any really negative sort of way... more of a "Such is life" sort of comment. We all have too much to do & too much that we'd like to do. It can't all be done, so something has to fall by the wayside. Any sort of maintenance usually makes up most of the stuff we discard, not having enough hours in the day. That actually makes sense because the benefits from maintenance are mostly theoretical, while the stuff we do, do, can have immediate benefits. Sometimes you can get away with that -- sometimes you can't. People with a more tech background are often called in the latter case, & they pretty much universally develop the perception that people just don't do what they should, & so I'd *guess* the word lazy found it's way into the discussion. <i>"As fas as being ‘A useful program, if you are lazy with updates.’ is concerned, if we adopted that thought process in all things then we would not use computers and many other time saving gadgets in our lives in the first place would we? "</i> I don't think Karl meant it in any really negative sort of way... more of a "Such is life" sort of comment. We all have too much to do &amp; too much that we'd like to do. It can't all be done, so something has to fall by the wayside. Any sort of maintenance usually makes up most of the stuff we discard, not having enough hours in the day. That actually makes sense because the benefits from maintenance are mostly theoretical, while the stuff we do, do, can have immediate benefits. Sometimes you can get away with that -- sometimes you can't. People with a more tech background are often called in the latter case, &amp; they pretty much universally develop the perception that people just don't do what they should, &amp; so I'd *guess* the word lazy found it's way into the discussion. I always check who is the software developer. If it is one that you have a good experience with using their software, then download and try it out. If it is a developer that has many bad reviews for its software and tends to bundle along toolbars, hijack your home page, change your web search engine, deny user access to make changes to msconfig, secretly install Relevant Knowledge, install Babylon, plus various unknown exe processes --- then stay away from the software. Sometimes even an attempt to system will not work, and the system freezes. I always check who is the software developer. If it is one that you have a good experience with using their software, then download and try it out. If it is a developer that has many bad reviews for its software and tends to bundle along toolbars, hijack your home page, change your web search engine, deny user access to make changes to msconfig, secretly install Relevant Knowledge, install Babylon, plus various unknown exe processes --- then stay away from the software. Sometimes even an attempt to system will not work, and the system freezes. Does that sound familiar? This is clearly not KC Softwares. I am a little confused, happens sometimes... on kc softwares website SUMo page I find SUMo is Free Software, in addition There is a very small entry for SUMo Pro and it only lists "SUMo PRO adds automatic self-update capabilities to SUMo." I did use the program of GOTD-today: I still uses sometimes WinXP. It did find a update in AVG User Interface? I did update AVG just 1 minute ago. Also a second run gave more info. I also run ""FileHippo App Manager 2.0 Beta 2"
This program found a update for Windows Media Player: 8 -> 11 for WinXP. After the update WMP was in a different language; strange. There is a little known and free alternative at http://secunia_personal_software_inspector.en.softonic.com/download. 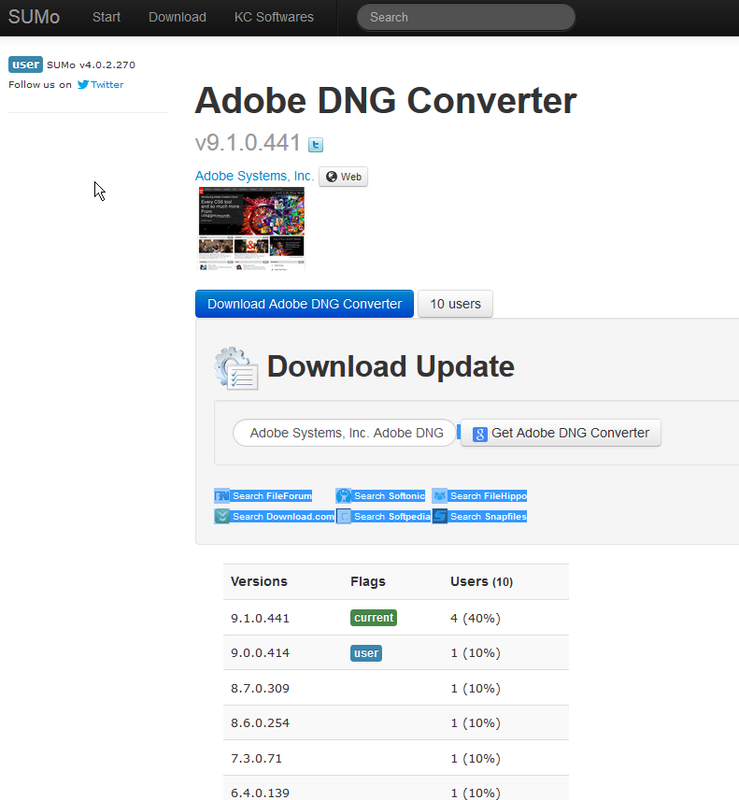 This link is for version 2, though version 3 has been released and is still free. Some folks prefer version 2. The software is called Secunia PSI and it tracks MS as well as other software for available patches. So, $15 per year or free, your choice. I've used both SuMo and Secunia PSI, I uninstalled Secunia. SuMo found 228 programs, Secunia 146. SuMo recognizes a lot of portable programs by links in the start menu and Secunia doesn't. Secunia will update automatically by downloading and installing them, SuMo you have to do yourself. SuMo is VERY useful if you have a LOT of portable utilities as I do. When using update programs like this, it's best to tell them to ignore Windows updates, that is something best left to Microsoft. I've used both SuMo and Secunia PSI, I uninstalled Secunia. SuMo found 228 programs, Secunia 146. SuMo recognizes a lot of portable programs by links in the start menu and Secunia doesn't. Secunia will update automatically by downloading and installing them, SuMo you have to do yourself. SuMo is VERY useful if you have a LOT of portable utilities as I do. When using update programs like this, it's best to tell them to ignore Windows updates, that is something best left to Microsoft. It it ain't broken, fixing it may break it. Lol!!! So true,that's why I have OLDVERSION.com bookmarked, as their site says, "Because newer is not always better." I have filehippo, checks all software I want updated, costs absolutely nothing. Installed and registered without problems on a Windows 7 Home, 32 bit system. I'll say this: Does a much better job than FileHippo, which I've been using for many years. This company also has driver update software for the same price. Hey, how about selling us both at a "bundle" discount? In which terms you mean "does a better job than filehippo? ", finds more update? else? DUMo not proposed in GOTD so far. If user would like it, and GOTD accept, we might consider it in a short future. There is one thing I don't understand. i.e. File Hyppo search for updates and show the download link in its page, SUMO search for updates, link tu SUMO page and you have to google to download the update, is this correct? If yes it seems to me that file hyppo (which is free) is a better choice. There is one thing I don't understand. i.e. File Hyppo search for updates and show the download link in its page, SUMO search for updates, link tu SUMO page and you have to google to download the update, is this correct? If yes it seems to me that file hyppo (which is free) is a better choice. where am I wrong? I thought that too. Thought it was just me and I was missing something. I used Sumo a few years ago and I'm sure you never had to do that then. Sumo usually also has a Web link to the homepage of the update software, so you can get the update from there. It doesn't have a link for every software company, but does for most companies. I see the price given above is the price for a one year subscription, so I assume that's what is being given out? Current Giveaway of for the full 4.0.x branch. We are currently at 4.0.2 and as you can see in our bug tracker, 4.0.3 and 4.0.4 are already scheduled, with a 4.0.5 likely to be released before switching to the 4.1 branch. So the free licence won't be broken in 1 week and you'll be able to fully enjoy the automatic update feature. I pass on Windows 10, it probably does not make sense to install? Unfortunately I don't have that choice! AVG antivirus flagged and put some important Sound Card files into the vault, which I deleted (Big Mistake) whilst uninstalling (Rotten Programming Practices of AVG). Anyways now I don't have sound in my Laptop running Windows 8.1 and hopefully by upgrading (FREE I understand) to Windows 10, this problem will be resolved. Only fear is that "Will all my earlier downloaded programs work with new Windows 10 and will I be able to keep them, Registration Keys intact. during the upgrade process?" Hope somebody knowledgeable here might respond to my query!! I have been running several machines on windows 10 for months now and most of my software works fine on Win 10. I highly recommend Win 10 pro for those not afraid to learn another system. There has been a little wait for certain programs to be supported but it is happenning. I did have to get reinstall rights and simply told them I had upgraded to Win 10 and promised to let them know how their software works. Sometimes one does have to find another program to fulfill their needs. I personally am a power user and have not gone back to Win 7 Pro in over 4 mos now! I hope this answers your question! BTW, SUMO is excellent, and it is absolutely not true that 99% of the apps have buitl-in update notifications. Perhaps 10% have it, and anyway I prefer a centralised method to retrieve all updates at the same time, when I have enough time to do it. I hate to be interrupted in my work because I need to update a software that I must use immediately. I have therefore tried several free update programs similar to SUMO, and some are handy (like the FileHyppo Update Checker), but SUMO is by far the most complete one. I hope only that updates to Sumo pro will be possible, because indeed the updates of this program are frequent, and I wonder if it will be possible to skip them, or keep the pro version anyway. Installed and registered without problems on a Win 8.1.3 Pro 64 bit system. A clean install. The registration key would not loose anything with 10 digits less. A (French) company without name and address. Damien, you know, that you are violating French and European law? A resizable window opens. In the settings you can change language, enable/disable different parameters from driver update to registry scan. The program scans the installed software, sends all information to their server and compares the list. If you have any privacy concerns (see yesterday) you surely would not do this. For this test I have no problems. A useful program, if you are lazy with updates. Of course, SUMO finds updates for software which you cannot update, like GOTD offers. If you have no problems in sharing all information about installed software on your computer with other parties (vendors, marketeers, producers...) than you can install this. It does, what it claims. I SO appreciate Karl's daily reviews. Thank you for being so helpful. Karl, I like your reviews. But your incessant focus on "name and address" and admonishing people for not publishing it gets tiresome and redundant. It may technically be the law in some places to publish it, but it's also a privacy issue for individuals who don't earn a fortune creating software. If every software author had to publish their own address, we would have THOUSANDS upon THOUSANDS fewer software programs, and especially here. This constant fixation is the weakest aspect of your reviews. No disrespect intended. If you consider this is not enougth in terms of identification, please contact me directly to discuss this topic. In the meanwhile i'd appreciate that you correct your reviews on our company's software on that point. Thank you for your reviews !! The company address is listed on KC Software's Homepage under "Contacts". Click on contacts and scroll down. Address is at bottom of page. There is nothing hidden here: www.kcsoftwares.com/?contacts. Address is at the bottom of the page. There is nothing hidden here: <a href="http://www.kcsoftwares.com/?contacts" rel="nofollow">www.kcsoftwares.com/?contacts</a>. Address is at the bottom of the page. it is very simple to understand. Also as software producer/vendor you do not act outside the law. You are (if you are selling software) a legal contract partner, no matter in which country besides Nigeria or other countries in this class. To hide in anonymity is like a moonlighter, nothing else. Of course there exist moonlighters everywhere, but I point in my short review which (one person) company fulfills for good reasons the legal requirements and which not. My advice, simply don't read my comment, because the information whether this is an illegal acting company or not is an important information about the reliability of a producer. No need to contact you directly. "If you consider this is not enougth in terms of identification" It is not in my consideration, take a look into your countries law, which is European law. Starting from responsible person for the web page over responsible person for the business over tax number, company correct postal address, phone number... you can find the the law text, how legal company information is published. This has nothing to do, what I consider right or wrong. papin, if I put that 31190 AUTERIVE, FRANCE so called "address" in google maps all it can do is show the area called AUTERIVE in France, not the registered street address of the buisiness as required by both French law and EU wide directive that state it has to be openly published on all commercial websites of buisinesses trading across europe. 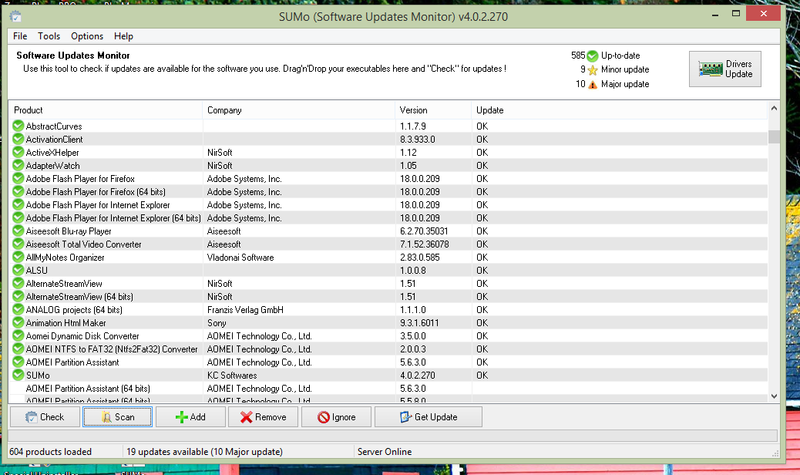 Having used the free version of SUMo for some time now, I can state that the software updates on almost a weekly basis. So, unless this version comes with updates included, it's going to be obsolete within the month. We are currently at 4.0.2 and as you can see in our bug tracker, 4.0.3 and 4.0.4 are already scheduled, with a 4.0.5 likely to be released before switching to the 4.1 branch. So the free licence won’t be broken in 1 week and you’ll be able to fully enjoy the automatic update feature. 99% of all installed software has a built/in update notification feature already. No need to install this software. But, of course, when servicing a computer, such as someone else in the family, or revisiting an older one I haven't used in a while, how are you even going to FIND all their installed software, especially ad-ins?!? This is a great INVENTORY software, going well beyond Microsoft's own [ Programs .. ] control panel. It found many programs without "proper" versions registered ... and, sadly, no way to [ Click here to fix this ] -- what, reinstall or just live with it, or, as suggested, use any unlisted program's self-updater, or check manually? Combine this with IOBit Uninstaller, and Windows File Explorer and you'd have a nice Operating system (neither this nor any Uninstaller lets you actually RUN the program pointed at!). Why not include this in right-click [ Check for Updates ] on ANY program dynamically at shortcuts and in Windows Explorer? Thanks for this -- a great tool, and like any other in my toolkit, I don't expect it to do everything other tools do, but glad to have it on-board.
. But, of course, when servicing a computer, such as someone else in the family, or revisiting an older one I haven't used in a while, how are you even going to FIND all their installed software, especially ad-ins?!? This is a great INVENTORY software, going well beyond Microsoft's own [ Programs .. ] control panel. It found many programs without "proper" versions registered ... and, sadly, no way to [ Click here to fix this ] -- what, reinstall or just live with it, or, as suggested, use any unlisted program's self-updater, or check manually? Combine this with IOBit Uninstaller, and Windows File Explorer and you'd have a nice Operating system (neither this nor any Uninstaller lets you actually RUN the program pointed at!). Why not include this in right-click [ Check for Updates ] on ANY program dynamically at shortcuts and in Windows Explorer? Thanks for this -- a great tool, and like any other in my toolkit, I don't expect it to do everything other tools do, but glad to have it on-board. .
let's face it... if you service a PC, say, you have 50 programs installed (not counting MS products), of which you are actively using on average 5 of them. Because most are in the utility category they are used once in a while every 2 months or so (fact is, they are hogging and eating up HD space and you easily forget what's eating up on your PC. Most likely you will uninstall these gadgets instead of updating them). When you use one of those 5 programs it's likely they push update notifications, so you update and the other programs remain space-hog monkeys in the background, because that's the way it is. Power users on the other hand have on average a software suite in daily use consisting of 3 to 5 major products from big software companies and such products have most of the time an update service running in task manager and download and install updates in the background. Examples are Autodesk, Adobe, SIEMENS, Catia, Pro/Engineer, ArchiCAD, MS Office and so forth. Today's Giveaway is in the utility category of space hogging gadgets. @Peter Blaise let's face it... if you service a PC, say, you have 50 programs installed (not counting MS products), of which you are actively using on average 5 of them. Because most are in the utility category they are used once in a while every 2 months or so (fact is, they are hogging and eating up HD space and you easily forget what's eating up on your PC. Most likely you will uninstall these gadgets instead of updating them). When you use one of those 5 programs it's likely they push update notifications, so you update and the other programs remain space-hog monkeys in the background, because that's the way it is. Power users on the other hand have on average a software suite in daily use consisting of 3 to 5 major products from big software companies and such products have most of the time an update service running in task manager and download and install updates in the background. Examples are Autodesk, Adobe, SIEMENS, Catia, Pro/Engineer, ArchiCAD, MS Office and so forth. Today's Giveaway is in the utility category of space hogging gadgets. A nice site to visit is https://ninite.com/. Saves some time on new PC installs if you don't have a good image.
" ... they are hogging and eating up HD space ..." and "... other programs remain space-hog monkeys"
Large capacity hard drives are so cheap and plentiful these days that we can install lots of programs and still have LOTS OF FREE SPACE remaining. So, i wouldn't characterise programs as space hogs just because they occupy some space and aren't used very often. Now, a REAL space hog would be, say, a 20GB - 30GB game download/install that you hardly ever play. Compared to that most other programs aren't really hogs, they're wee little piglets, LOL.
" ... they are hogging and eating up HD space ..." and "... other programs remain space-hog monkeys" Large capacity hard drives are so cheap and plentiful these days that we can install lots of programs and still have LOTS OF FREE SPACE remaining. So, i wouldn't characterise programs as space hogs just because they occupy some space and aren't used very often. Now, a REAL space hog would be, say, a 20GB - 30GB game download/install that you hardly ever play. Compared to that most other programs aren't really hogs, they're wee little piglets, LOL. We each use our computers differently, apparently (surprise! ), and deleting someone else's stuff willy-nilly is not an option. And I don't actually have much on this computer, just browsers, office suites, security suits, downloaders, and converters. This is -w-a-y- better than add/remove programs or any uninstaller. And FileHippo, FilePuma, Secunia, Ninite, even Heimdal (forget Software Informer sniffer! ), are quite limited in their aim and in their reports. This is a significant diagnostics tool, definitely a unique keeper. Are you on a Mac, or from the Mac world, @xenox? I ask because your use of a computer appears really simple, as the Mac advertisements promise (one click, no owner's manual). I like all the comments here, as they help me understand the variety of computer users out there. I'd hate to think anyone should be limited by another user's preferences. Hey, I know one person who [ F12 ] reinstalls their OS whenever their computer locks up -- they are happy with the out-of-the-box defaults, and use only email on the web and a self-installing local printer for web articles. Some here may have no use or capability to use this program, or even understand it ... not having used it, but I'm pleased to have found a well-experienced group of users in the other comments that do expand my understanding of features and benefits of the tools we are offered so generously here at Giveaway Of The Day.
. We each use our computers differently, apparently (surprise! ), and deleting someone else's stuff willy-nilly is not an option. My report on ONE computer (of dozens): 364 programs up to date (not 3 to 5 major programs, not 50 installs) 108 minor updates available 71 major updates available ________ 543 total items in report And I don't actually have much on this computer, just browsers, office suites, security suits, downloaders, and converters. This is -w-a-y- better than add/remove programs or any uninstaller. And FileHippo, FilePuma, Secunia, Ninite, even Heimdal (forget Software Informer sniffer! ), are quite limited in their aim and in their reports. This is a significant diagnostics tool, definitely a unique keeper. Are you on a Mac, or from the Mac world, @xenox? I ask because your use of a computer appears really simple, as the Mac advertisements promise (one click, no owner's manual). I like all the comments here, as they help me understand the variety of computer users out there. I'd hate to think anyone should be limited by another user's preferences. Hey, I know one person who [ F12 ] reinstalls their OS whenever their computer locks up -- they are happy with the out-of-the-box defaults, and use only email on the web and a self-installing local printer for web articles. Some here may have no use or capability to use this program, or even understand it ... not having used it, but I'm pleased to have found a well-experienced group of users in the other comments that do expand my understanding of features and benefits of the tools we are offered so generously here at Giveaway Of The Day. Thanks, everyone. Unless you turn off, or don't activate the update notifications, because, say, they're resource hogs, or nagging. Or you don't keep a minimum of programs. I also the doubt that the breakdowns you present reflect the real world. At any rate, SUMo is an excellent, and more importantly, trustworthy addition to anyone's toolbox. I also find nothing to support the notion that it is a space-hog. I've had the free version for years - it'll be nice to have the Pro. Unless you turn off, or don't activate the update notifications, because, say, they're resource hogs, or nagging. Or you don't keep a minimum of programs. I also the doubt that the breakdowns you present reflect the real world. At any rate, SUMo is an excellent, and more importantly, trustworthy addition to anyone's toolbox. I also find nothing to support the notion that it is a space-hog. I've had the free version for years - it'll be nice to have the Pro.